If you can't decide which set of plans is right for you, why not buy all of them? This complete set of drawings includes everything you'll need to build any of the designs shown in this category and many more. You can also use the drawings to create a custom building with just the options that you want. All of the designs are built around a simple, center pole-barn. With these drawings, you can start small now and add-on later. 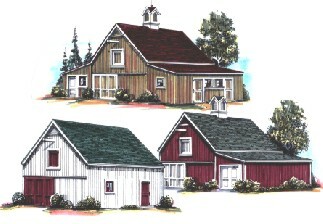 Like this barn plan? Buy the complete set now for just $59.00!